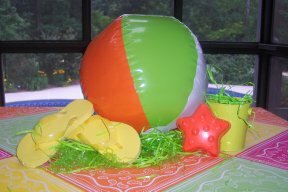 A beach ball party is a great theme for your next pool party. You can have fun with the invites, the decor, games and even the food. 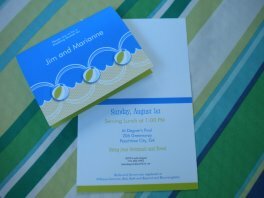 Printed invites that can be designed on line and then mailed to your home are a convenient way to get some invites. We designed these beach invites for a summer bridal shower to set the theme. I found these cute invites pictured above at BIRTHDAY IN A BOX and bought extras to use the beach balls as tags for the party bags. 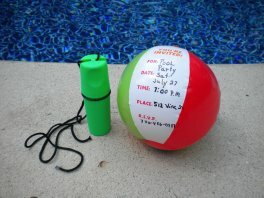 For another unique idea for beach ball invitations use real mini-beach balls. Buy small ones (around 5")that come in packs of 6 - 12. Inflate them and then write the details of the party with a fine tip permanent pen. Deflate them and send them off in a white, larger size envelope. Seal the envelope with beach ball or pool themed stickers. I love this set of 5 beach ball balloons. Balloons are an easy and inexpensive way to decorate - especially when they fit your themes so well like these do. A set of 5 costs only a little over $8 with free shipping. Place one with a couple of solid colored balloons on your mailbox or entrance and the others at the party table. Fill the pool with large - at least 24" beach balls - the bigger the better. Not only are they colorful but guests just gravitate to them. Soon they'll be tossed in the air for all kinds of pool fun. You can get a set of 12 beach balls for less than $20 at Amazon. This is no ordinary beach ball - it's huge. Use this large beach ball sprinkler to greet your guests as they arrive to the party. Move it later for some fun sprinkler action. Hook it up to the hose and kids from two to ten enjoy the spouting water. At 88" it will be the "star" of the party. 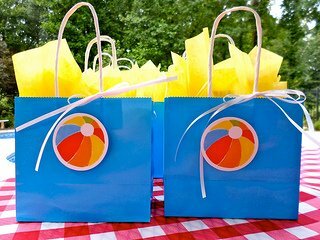 Beach ball themed party supplies can be anything from plates to candles to napkins. Rather than everything matching, use an assortment of solid, brightly colored plates, napkins, cups and tablecloth. For your centerpiece, use mini beach balls and set them on a large round plate with sand on the bottom. Beach Themed Party Plates & Napkins, 14-ct. Hang beach ball paper lanterns from your patio umbrella ribs. These are 9.5" and come as a set of three. The bright "beachy" colors will add lots of pops of color. 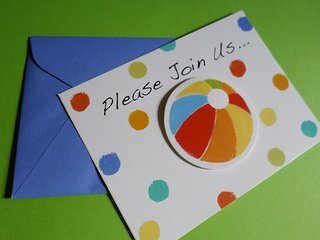 I bought an extra set of beach ball invitations from Birthday in a Box and used the colorful beach balls that already had stickers on them so they would stick to the party bags. For our adult girls beach party I bought packages of solid colored paper coasters. Found them at Target for less than $3 each. For kids party favors use colorful mini beach balls. 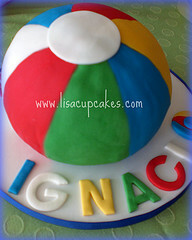 This beach ball cake from lisacupcakes.com would be a big hit for any swimming pool party. 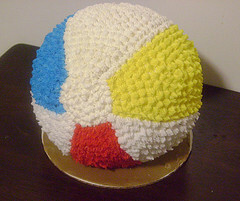 A beach ball cake is quick and easy if you use the ball shaped cake pan made by Wilton. Simply make a cake in the form and frost it with beach ball stripes and colors. Or you can make a two layered cake using round cake pans and decorate the top to look like a beach ball. 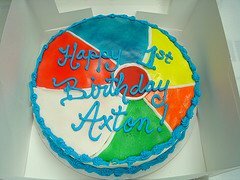 Credit to Glaized Cakes for Picture A cake made in the form of a beach ball becomes simple if you use Wilton Sports Ball Pan Set . Simply make your favorite flavored cake in the form and then frost it using butter frosting. You can use a cake decorating tip to give it the look of this picture or simply frost it a solid white color and using a decorator tip or store bought cake decorating gel to add the beach ball stripes. This cake can be easily made by simply using two round cake pans. Make your favorite flavored cake and then frost it with white frosting. Using a cake decorating tip outline the cake with colored frosting to look like a beach ball. You can also buy colored cake decorating gels at the store in different bright colors to outline the beach ball. Cupcakes are an easy way to serve dessert and then top them with a cup cake pick or cupcake ring. I love to use cupcake wrappers for extra color. Bake your cupcakes using cheap cupcake liners and then after they have cooled, wrap them with a solid color, striped or polka dot cup cake wrappers. What's a party without a beach ball game? Here is one that works for many different ages. Give a person a large blown up beach ball. See how many times that person can tap the ball and keep it the air before it hits the ground (or the water if the game is in the pool). Another alternative would be to see how many times two people can tap the ball to each other before it drops. The person or team that keeps it in the air the most amount of times wins.